For example the roll above at is a Thermal Roll 80mm Width & 70mm Diameter. The Code is then TH80-70. The Width is important but the Diameter of Roll that you select can be less than the Roll that you currently have. 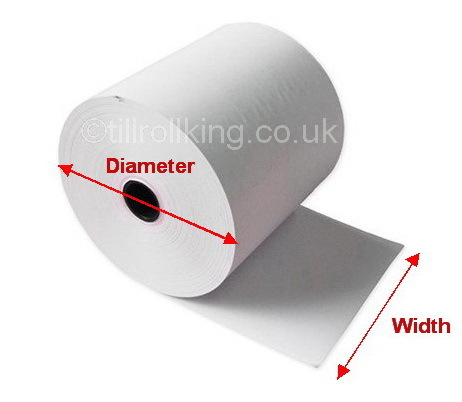 If for example your roll measures 80mm x 72mm then an 80mm x 70mm roll will fit without problems. If in doubt, please give us a call on 0800 564 2232. We're more than happy to help you out on the phone. These Till Rolls are used in Impact (Dot Matrix) printers. You can tell if the equipment you are using is an Impact Printer by seeing if it uses a Ribbon. These Till Rolls are used in Impact (Dot Matrix) printers and produce 2 copies at the same time. You can tell if the equipment you are using is an Impact Printer by seeing if it uses a Ribbon. These Till Rolls are used in Impact (Dot Matrix) printers and produce 3 copies at the same time. You can tell if the equipment you are using is an Impact Printer by seeing if it uses a Ribbon. We send the majority of our Parcels with Parcelforce & Royal Mail. Some light Parcels to remote locations are sent with Hermes. WE NEVER USE YODEL FOR DELIVERIES. All Parcels delivered to UK Mainland, Scottish Highlands & Islands, Northern Ireland, Scilly Islands, Isle of Man, Isle of Wight & Channel Islands are FREE. Deliveries normally arrive within 1-2 days. Exceptions to that are as listed below where a Next Day service is not guaranteed. Next day delivery is available for just £1.99 and will be dispatched with Parcelforce 24. At Till Roll King we have been supplying Till Rolls since 1997 and have extremely good product knowledge. Our Rolls & Ribbons finder is guaranteed to be 100% accurate. We stock and dispatch everything from our Warehouse in Bournemouth. If you are stuck, need advice or would like to speak to any of our very happy staff please call us on 0800 564 2232.